So let’s move to series tracker and see what are we going to learn today. So far, we have discussed five main components. Today we will be discussing Views and Routing. 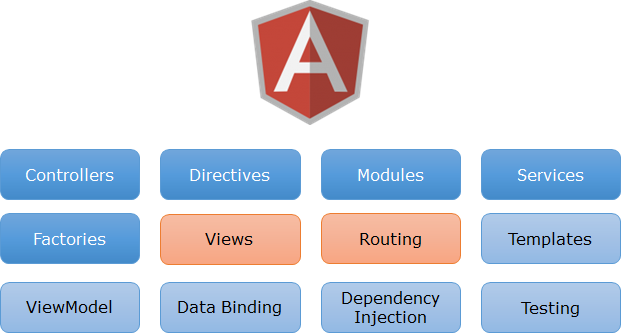 AngularJS provides a robust solution to handle these scenario. First it enables us to help in maintaining multiple views of the page in separate files, that will be used to load the particular view. It also allows us to have different URL based on view. Let’s understand Views and Routing. Views – To have different views on the page, we have different templates which gets rendered on in ng-view directive based on the routes. Routing – Routing plays a key role of having multiple views on the same page. It enables us to provide different templates (View) and controller based on URL. On clicking particular url, the corresponding template is loaded based on the assigned controller. Routing is supported by another angular service called $routeprovider. There is major breaking changes took place in 1.2.*. In this version, routing ($routeprovider) is not part of main angular library and to use it we need to include another plugin (angular-route.js) and while creating the module we need to pass ngModule. We’ll see in coming example. Note – These Views are similar to ASP.NET MVC views. For each view there is a Controller associated, which uses the View and add required data to render it on the UI. So let’s discuss the example. We’ll take the last post’s sample and scale it up. In that example, we displayed Talk details on the page. Now we will display speaker details on that page as well. So we’ll have two tabs: Talk Details and Speaker Details. And by clicking on the tabs, corresponding details will be displayed. It is similar to getTalks that we discussed in my last post. Here I have used navbar to create the navigation links. Please refer the href links, one is for Talks and another for Speakers. As discussed, inside ng-view the required templates will be rendered. As we earlier discussed that module is like container to all the features and services. Route is configured via config method in module. Path of the link should be same as the path used in the navigation links. Now our application is ready and let’s run this. When I clicked the speaker the URL also got changed which enables us to bookmark the URL based on the view. In both the URL, one thing we notice that route that we defined got added with # which also helps in conflicting the other routing like ASP.NET MVC routing. Hope you have enjoyed this post. To navigate to previous and next post of the series, use the links at the bottom of the post. 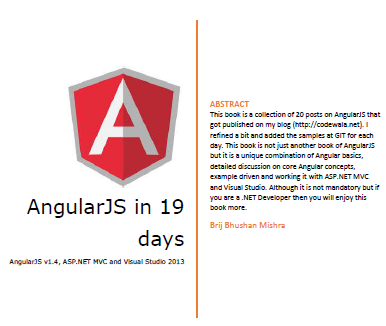 This entry was posted in AngularJS, ASP.NET MVC and tagged AngularJS, ASPNET MVC. Bookmark the permalink. Sort of academically, but no stranger to taming complexity through abstractions, DI, etc, for simple routes this is great. Thoughts concerning the Angular team’s direction re: decoupling routing (I understand they are revamping the whole thing, too), competition between ‘third party’ extensions, like UI Router, Angular Route Segment, etc? Hi Brij, Just now i tried this codes , i have included this code in default mvc project. Then i got some issues with Routing concepts, once i clicked the Angular JS page, then it will not work our mvc default routing concept[ex : i can’t able to see the Home,AboutUs ,Contact pages ]. Please let me know, is there any limitation with both routing concepts? After running the application,Talks and Speakers links are not working. Throwing error -The resource cannot be found. Try Cntrl-F5 in browser. You probably have the eventModule.js version of the previous lesson cached. And that version lacks the routing. Thanks for your comment. I checked and found it working. Routes are already defined in eventModule.js. Can you please let me know what do you see when you run? I have gone through this blog and its just working fine. Only my doubt is that once both views for Talks and Speakers are rendered on page and after that whenever I click on any button, it is not retrieving data from controller. Instead it just shows and hide views. So in this case, I will not retrieve data from database every time.